A fresh, effective, and enduring way to lead—starting with your next interaction. Most leaders feel the inevitable interruptions in their jam-packed days are troublesome. 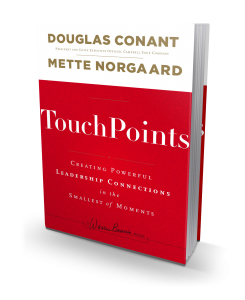 But in TouchPoints, Conant and Norgaard argue that these—and every point of contact with other people—are overlooked opportunities for leaders to increase their impact and promote their organization’s strategy and values. Through previously untold stories from Conant’s tenure as CEO of Campbell Soup Company and Norgaard’s vast consulting experience, the authors show that a leader’s impact and legacy are built through hundreds, even thousands, of interactive moments in time. The good news is that anyone can develop “TouchPoint” mastery by focusing on three essential components: head, heart, and hands. Douglas Conant is the former president and CEO of Campbell Soup Company. Under his leadership, Campbell reversed a precipitous decline in market value and employee engagement, improving its financial profile, enhancing its diversity and inclusion practices and raising its corporate social responsibility profile. 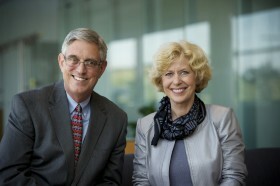 Previously, Conant held management positions at Kraft and General Mills and was president of the Nabisco Foods Company. He blogs regularly on HarvardBusinessReview.org. Mette Norgaard is an expert on strategic leadership and learning. She works with executive teams around the world to create distinct learning solutions that advance their companies’ strategies. She has worked senior-level leaders from Microsoft, Proctor & Gamble, GE Capital, Nucor Corp., Estée Lauder, Harley-Davidson, The U.S. Navy and Pfizer. Norgaard is the author of the international bestseller The Ugly Duckling Goes to Work (2005), published by the American Management Association.